Afridi quitting Test cricket again! Posted byAditya Kane	 July 16, 2010 1 Comment on Afridi quitting Test cricket again! Afridi is a bit of a wild card for Pakistan. He has lost of talent which is evident when he scores big runs in a hurry once in a few years but more or less he has always been a talented cricketer with very little to show in terms of performance. He has been fined a few times and had run ins with opposition players and was caught on tape in one of the most bizarre cases of ball tampering. Afridi bit the ball to tamper with it. Yes! He actually did bite it. 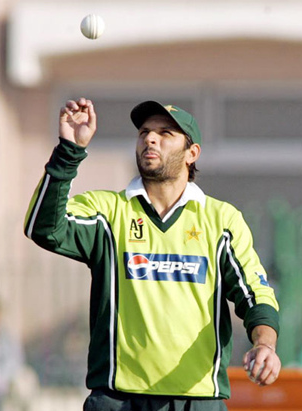 If Afridi has been inconsistent as a performer, it seems that his thinking or decision making is also inconsistent. He has been threatening to quit Test cricket for ages. He quit it finally and strange ended up being the T20 captain and also ODI captain. Then he came out of retirement form Test cricket and captained the Pakistan side in England against Australia. Afridi is quite representative of the state that Pakistan cricket is in right now as it also has been changing its mind quite often. So the latest news in the cricket world is Afridi has quit Test cricket once again. I won’t be surprised if he comes back out of retirement in a year and then retires again. What do you think? Is this the final time for Shahid Afridi? Do let me know through your comments. What could be India’s squad in 2011 ICC World Cup? 10 reasons T20 Champions League is a flop show! I feel entire Pakistan Cricket Board lacks decision taking ability, which is why even after having some pretty good players, Pak at times suffer humiliating loss.